Put simply, this is THE bond to watch if you want to keep an eye on how the financial system is acting. It is the bedrock for all risk… and its yield represents rate of return against which all risk assets are priced/ valued. 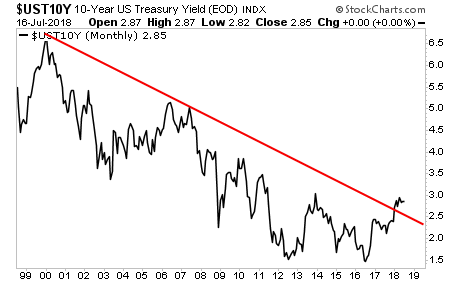 With that in mind, we need to note that the yield on the 10-Year US Treasury has broken ABOVE its long-term 20-year bull market trendline. This is a MAJOR problem. 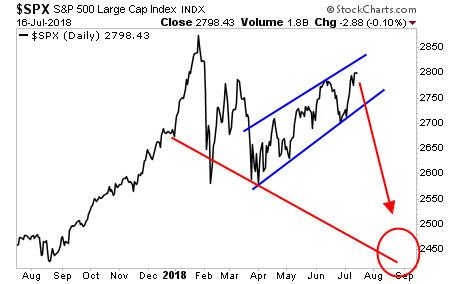 And the Fed is going to “fix” it by crashing stocks. The US financial system has over $60 trillion in debt securities sloshing around in it. ALL of this is priced based on the assumption that bond yields will continue to fall; which is why the fact that the yield on the 10-Year US Treasury is breaking out to the upside represents a true SYSTEMIC risk. The fact is that the Fed HAS TO act to stop the bond bubble from bursting. And it’s going to do this by crashing stocks, and driving capital into the bond market to force yields lower. This is why the Fed continues to hike interest rates and drain liquidity from the financial system via its now $40 billion per month QT program: the Fed HAS TO get bond yields back below their trendline. The stock market is now borrowed time. Yes, stocks can still push to the upside based on pumping a handful of Tech stocks… but the BIG picture is that the Fed is trying to crash stocks to save bonds.